Sophisticated space with light, airy colors and a retro-60s menu designed to enhance classic cocktails. About the restaurant & décor: Mixologist Julian Goglia and chef Mike Blydenstein put The Pinewood in Decatur on the culinary map, then began to branch out with this refined, retro-mid-20th-century classic establishment in Ponce City Market. Something of a throwback to the supper clubs of yore without the need to dress fancy, The Mercury presents an airy décor and a soft color palette to create a relaxing environment, although noise levels can get a bit energetic. 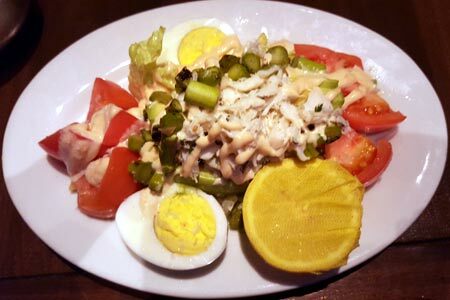 Likes: Small plates, such as a crab Louie, reclaiming from the archives of American culinary history a worthwhile dish. And the cocktails. Dislikes: Main plates that seem less interesting than the appetizers. Food & Drinks: Dishes you've not thought about in ages are given a burnished treatment, and the small plates work well as drink companions for a light repast. We liked the crab fritters so much we went with more crab and enjoyed the crab Louie, which adds avocado to the requisite asparagus accompaniment. It’s perfect for late-night supper. More robust meals include roasted Springer Mountain chicken, prime rib with all the trimmings and a couple of steaks. Desserts look back in time as well, with carrot cake and Key lime pie as standouts. The wine list is extensive and well chosen, with many at reasonable prices. By-the-glass offerings are appealing; go for a glass of the Graham Beck sparkling rosé from South Africa, which complements the crab selections. The brunch menu is tempting, and if your appetite and capacity justify the expense, there's a gargantuan "Bottomless Brunch" menu for $34.95.